It has become a yearly tradition to celebrate the birthday of our office manager by surprising her with an activity. This woman drives us insane at work sometimes, but we love her. She’s there when you need her, plain and simple. She’s the first one to offer to buy you a beer at the end of a rough day, and she has gone out of her way to help each and every one of us during difficult times. Last year, we took her to a drag show. This year, Paint Nite. Despite my love of art, I don’t have much ability in that area. I could never draw or sculpt or paint. This does not mean that I don’t love doing it. However, I’m also a bit of a perfectionist. So not doing well at it has often kept me from trying. What a shame! Paint Nite is perfect for people like me. 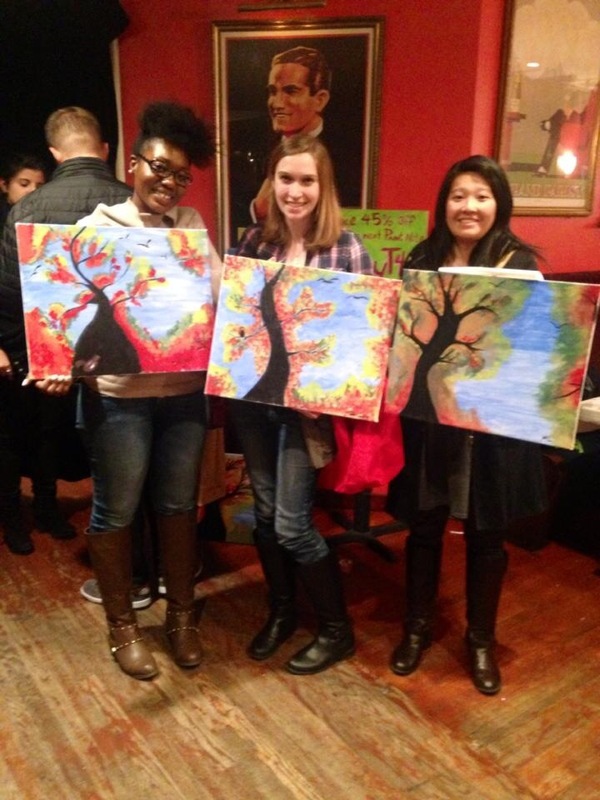 It’s simple, guided painting…at a bar! I sat down in front of my easel and felt dread, anxiety, nerves. “Mine won’t turn out well,” that negative voice inside me said. But after a couple of beers, I didn’t care. It was relaxing and fun and who cares what it turns out like. It doesn’t look too bad, right? While I was painting I felt so self conscious about the tree, the colors, the brushstrokes. But at some point, I listened to my friends laughing around me, and I let myself have fun with it. Once all was said and done, I’m quite proud of it! One of the most intriguing things about the whole experience was just how different everyone’s turned out. 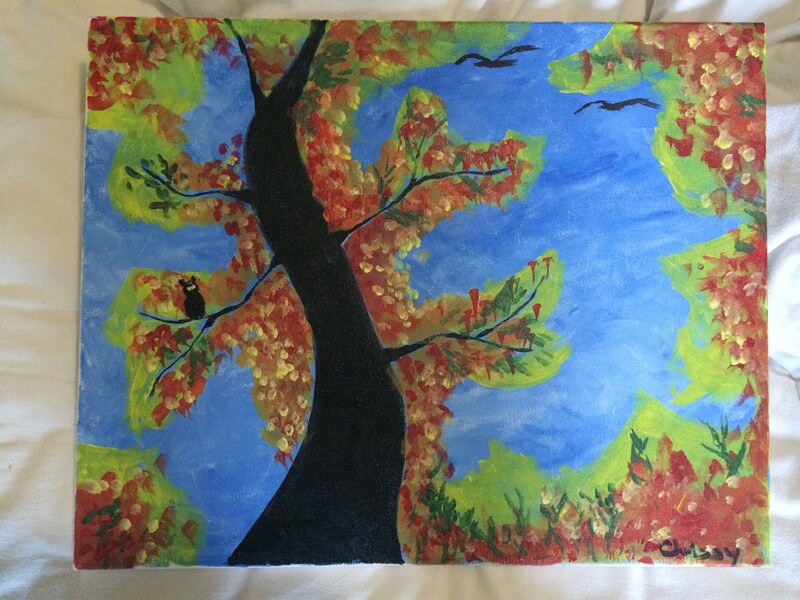 Yes, we all have a curvy tree with fall colors, but everyone’s painting was uniquely their own. Maybe it’s a credit to the leader of the class that each of our individual styles were able to come out. Look how fiery and bold Junie’s is. Just like her! Look how smooth and delicate Mei’s is. Totally her personality. I enjoyed that mine (not on purpose) looks to have desert mountains and cacti growing, a reflection of my Nevada roots. I’m addicted! I want to go every week. Although I’m not exactly sure what I would do with all those canvases. 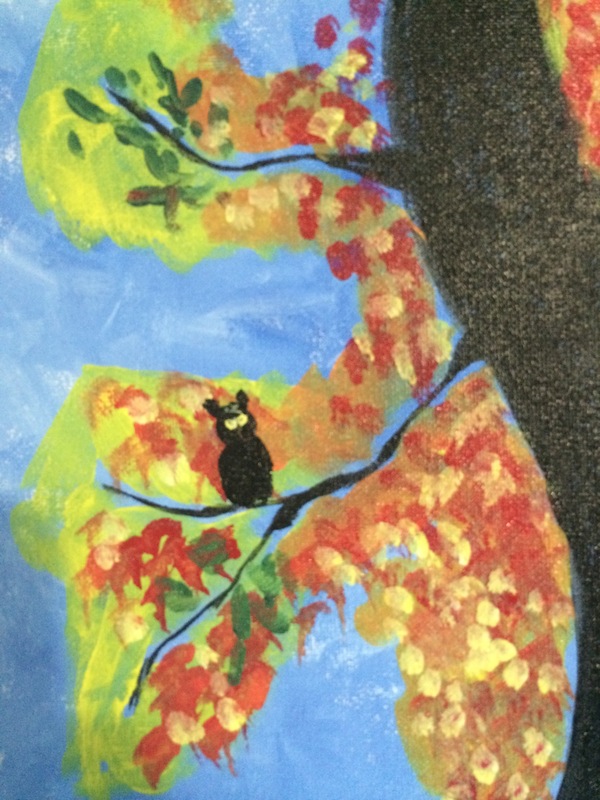 The only negative thing I will say about the drinking is that it led me to believe that I was capable of painting an owl. Where I got this idea, I’m not sure. But it came out more looking like a gummi bear. I think it’s beautiful! Put it on the wall!